The artist Isaac Levitan is known in our country as a landscape painter, depicting in his paintings the nature of the middle band. Perhaps no one, like Levitan, was able to display the greatness of Russian nature and transfer to the canvas the changing moods of different seasons. Gentle and vulnerable in character, Levitan had a surprisingly strong sense of empathy, helping him to catch the subtle emotional vibes of the landscapes he depicted. Nature in the artist’s paintings breathes and lives – Levitan’s attentive eye notices the details and subtleties that make up the essence of weather changes. 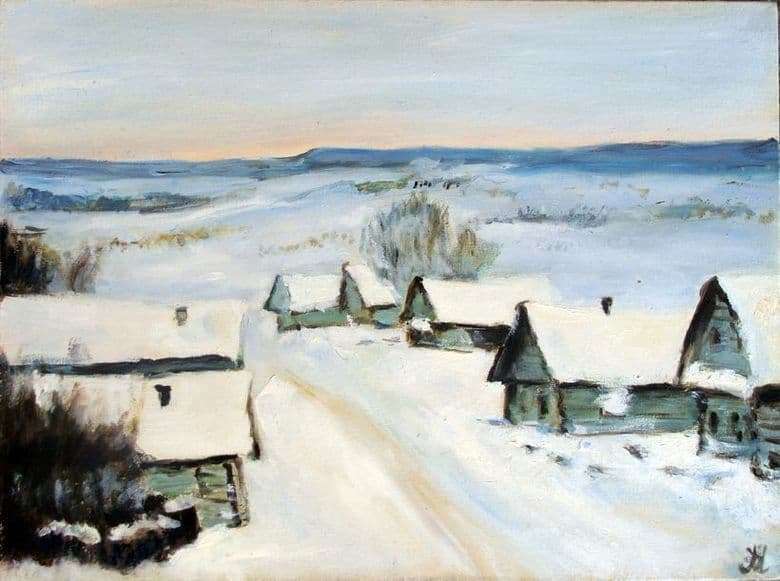 The painting “Village. Winter” was painted by the artist in 1878. Isaac was then eighteen years old, this is the first of his most famous paintings. But this early canvas reveals to the viewer the unconditional talent of the artist – behind the seeming simplicity of the landscape a poetic rhythm is born, and a perfectly built perspective makes the picture photographically accurate. The core of the compositional structure is the road that has been drifted into the distance, trodden in the snow between two snowdrifts. Country houses of the same type on both sides of the road are covered with snow like cotton wool; the bare trees in the background also hid their branches under the snow. A blue strip of snow-covered forest in the distance separates the horizon from the pink ruddy sky. The period of writing a picture was a difficult time for the artist. His mother died in 1875, and later, in 1877, his father died of typhus. Isaac, like his brothers and sisters, was in great need, often spent the night in the workshop, lived mostly for material assistance from the art school, where he received an education. But despite all the complexities of his real life, the world of Levitan’s landscapes is imbued with serenity and greatness.